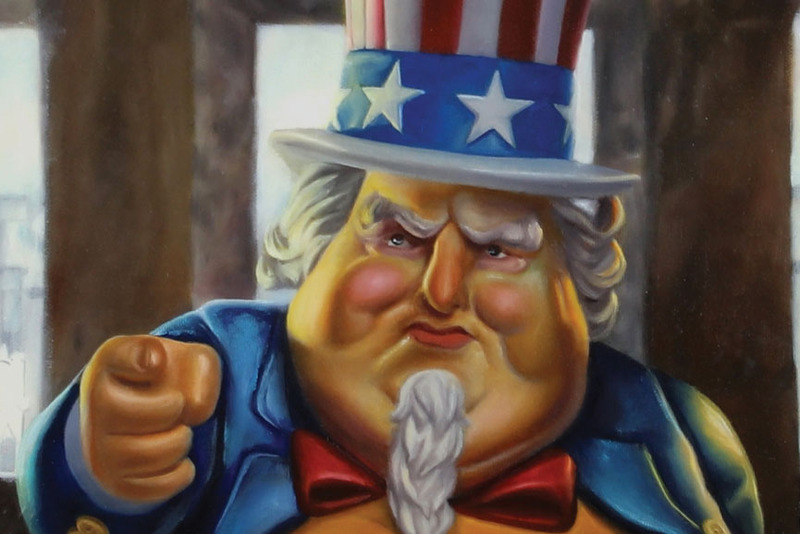 What can we say about Ron English that you don’t already know? He has been around for quite a long time, and everything he does is apparently still on point. 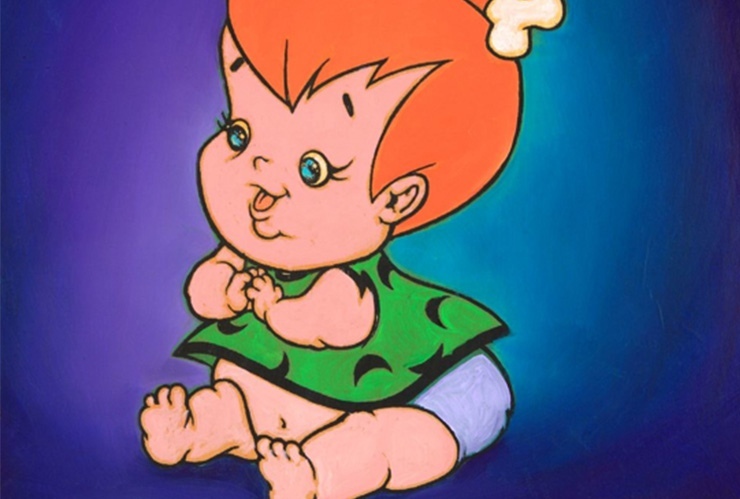 From hijacking and manipulating commercial billboards in the 80s and throughout the 90s, to inventing his own world of alternate versions of popular characters, some of which are infamous, some just humorous and amusing – Ron English became very close to being a pop star himself, but the educating, heroic one. The intent of his works was always to provoke the system that we are unwillingly part of, and to challenge the modes through which we perceive the reality of our everyday lives. One cannot ignore the fact that most of his creations tend to blur the line between true intentions and irony, and therefore constantly put our thoughts to a test. 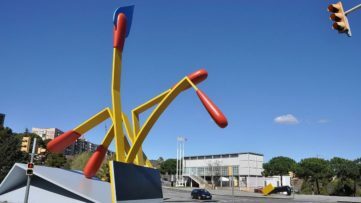 Done in the same, expressive manner of commercial visual representation that the corporate advertisers often use, his paintings, sculptures, and basically all of his actions, are equally confusing and eye-catching. He is the real, old-school example of a creative prankster, and you can indeed tell how much the artist really loves what he is doing, and obviously so does his audience. 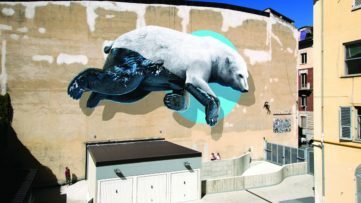 As for Widewalls, the fact that he is our Artist of the Week for the second time probably speaks for itself. He is definitely one of the most influential American artists today. The problem with artists who are very popular, who are greatly involved in many different disciplines, and whose careers span decades, is that there is so much to talk about. Yet on the other hand, so much has already been said! 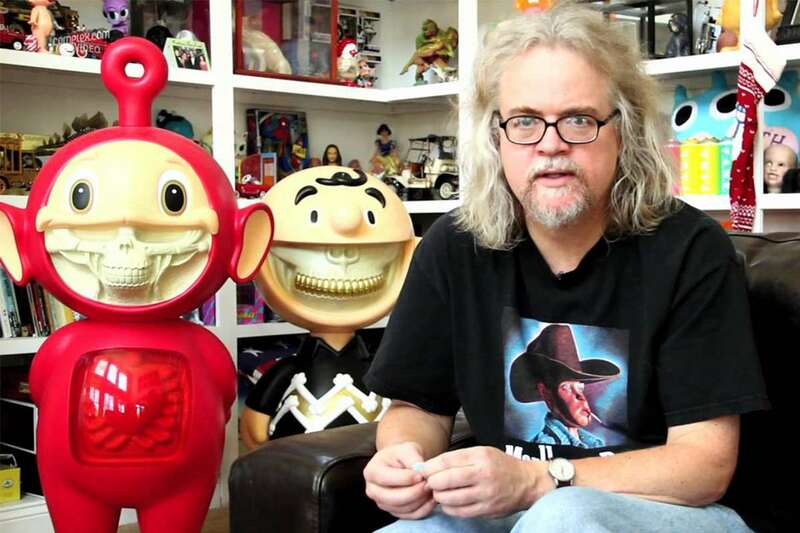 It is very unlikely that people don’t know about Ron English’s ridiculously famous POPaganda characters, his vinyl toys, paintings and sculptures. Most people have also probably heard about his anti-commercial campaigns (if we choose to call them so), from the 90s, when he was making real-life parodies based on existing billboard slogans and images. However, we recently came across a lesser known project of his, which we mentioned in the interview we had with English a few weeks ago. It is such an inspirational move that he made, and it really shows how dedicated he is to the morals he believes in. The project was made in collaboration with the Guggenheim fund, and it involved local children from the Bronx. 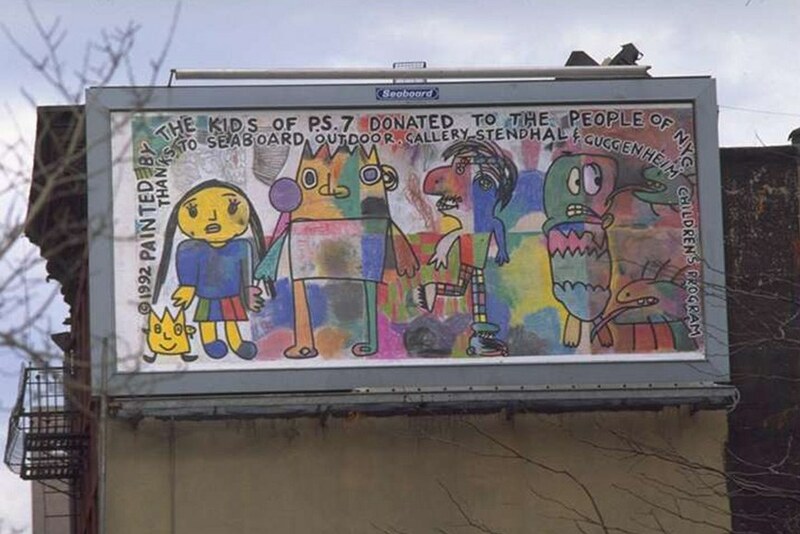 The idea was to make a huge billboard that displays the ever-endearing innocent children’s drawings, and to consequently show these children how culture is not a “one way street“, but rather something that they could, and should, also be involved in. Ron English took his all-too-famous relationship with the billboards to a whole other level at that point. It is really something worth mentioning. 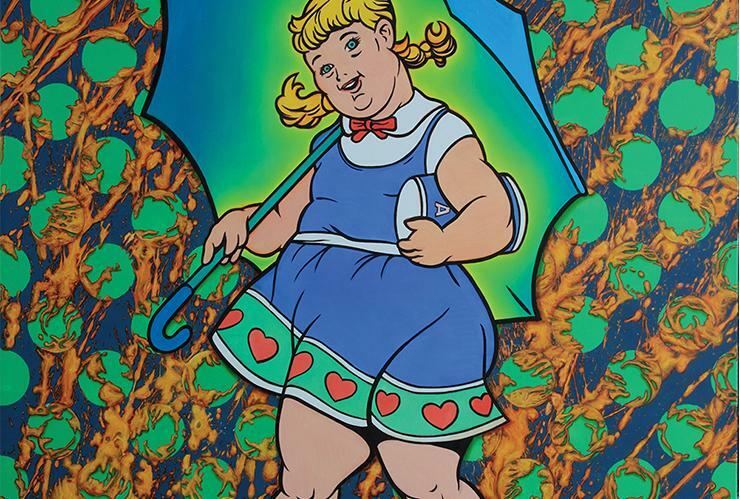 When trying to categorize Ron English’s style, apart from his obvious relevance to Urban Art and Street Art, it is not really easy to decide whether his work should be associated with Pop Art, or with something that could perhaps be labeled as Post-Pop Art. He is very critical of today’s society, and yet the way that he deals with the subject is ultimately POP-ish itself (after all, English does have his own brand named POPaganda, which he described as a different kind of an advertising agency – the one that encourages your good side, the one that tells you to eat healthy food and to treat yourself better). When criticizing the society and the consumerist mind, he really does it in a very powerful, distinctive manner, which you eventually realize you even start to like, just like you would probably like some branded product (and let’s face it, we all indulge in consumerism from time to time). The upcoming exhibition at Dorothy Circus Gallery will probably tackle the similar topics, having the title itself in mind, and also what he said about the show himself: The most toxic and short term incarnation: sort of ecstasy. 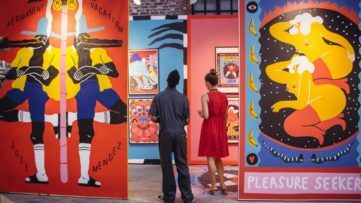 The exhibition runs from February 20th, so if you have the chance to go – don’t miss it, and of course read more about the show itself and what to expect, although English will probably never tell you everything – you’ll have to see for yourself. 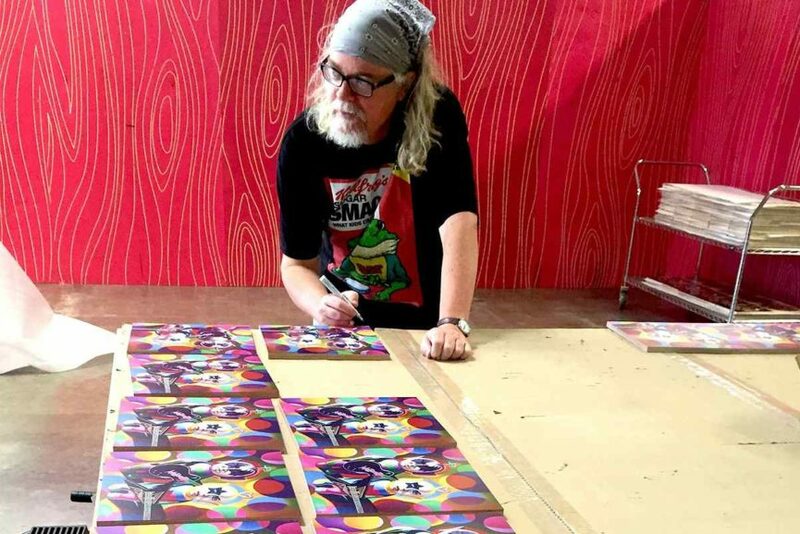 Featured image: Ron English in his Studio, source: YouTube; Ron English signing his works All images used for illustrative purposes only. Moniker NY 2019 To Kick Off From a New Manhattan Location!